Scarcely a day goes by that we don’t hear of another smart phone application (app) being developed for every industry – and seemingly for every market and demographic. With this sudden influx of technology that promises to make our lives easier and better, have we reached the saturation point in what these new programs can do for us? Not by a long shot. Apps relating to eyecare and eyewear are emerging left, right and centre for eyecare practitioners as well as for consumers. A host of apps are available for every type of smart phone, encompassing a myriad of topics such as eye health, eye exams, dispensing, medical education, and contact lens wear and care. As for eyewear consumers, they can also enjoy techno-forward apps that offer such services as try-on eyewear and vision enhancement. So how does the iPhone, for example, become the “eye phone”? The following is a sampling of apps that highlight the important ways in which technology has revolutionized the eyecare industry. A fascinating example of an eye exam tool that “outsmarts” the smartest patient is the Random Eye Chart app made by Dok LLC. Knowing that patients who frequently visit their optometrist may become habituated to the Snellen eye chart and memorize the chart’s letter order, techno-designers developed an app that scrambles the chart, randomizing the letter order. NETRA cell phone-based optometry solutions offers an interactive platform for measuring refractive errors and focal range, featuring a lenticular view-dependent display for use with the human eye at close range. The platform measures eye parameters such as refractive errors, focal range and lens opacity. Offering your patients the “at your fingertips” convenience of a professional dispensing video is a novel value-added service. EyeDispense HD is an iPad app, a “virtual video” that can help patients visualize what they’ll look like in a particular eyeglass frame. A simple panning shot captures video in 40 seconds, to a maximum of four frames. Patients can also compare one frame with the other. A convenient “pause” feature allows the patient to view any given angle. The final touch is being able to send photos by email or post them on Facebook for sharing purposes. The focus of EyeDock, another app created by an optometrist, is contact lens fitting and ophthalmic medication searches. It is a companion app to eyedock.com, a website for eyecare professionals. The Eye Handbook app is a comprehensive reference and diagnostic tool that includes calculators, equipment, as well as medication and treatment information. Optical Tool, developed by an optician, is designed to provide students, faculty and opticians with quick access to optical information. It currently has seven formulas (back vertex, compensated power, oblique meridian, Prentice’s Rule, resultant prism (resolving prism and thickness), and includes detailed information about each formula. At-home eye exams have become increasingly popular as consumers become proactive in testing and maintaining their health. 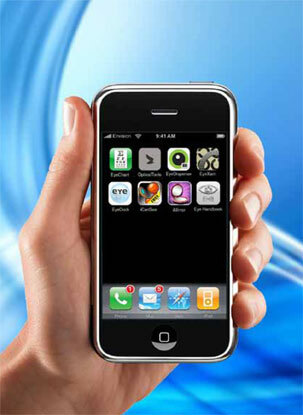 EyeXam is an example of an itunes app that combines several features such as tests for astigmatism and eye dominance. Perhaps its utilitarian design stems from the fact that it was developed by two optometrists. iCanSee packages the old-fashioned magnifying glass in a high-tech format. Simple magnification allows users to see in difficult situations, including low light. The app offers various degrees of magnification. A number of eyeglass frame manufacturers – including Silhouette with its iMirror – have launched apps that simplify the process of trying on glasses, making the frame selection process easier and faster – and an experience that can be shared digitally via Facebook, for example. No matter what your choice of app, there’s no doubt that this advanced smart phone technology has revolutionized the optical industry by allowing much more sophisticated medical information gathering and eye health assessment than previously existed. The now-famous adage, “There’s an app for that” holds as true for the optical industry as for any other. The advances in technology that these apps represent have, in some cases, blurred the line between the professional and consumer spaces. They have allowed consumers the opportunity to “enter the optometrist’s world” via at-home eye exams, for example. While sheer convenience makes this option an extremely attractive one, opticians, optometrists and ophthalmologists alike are aware of the fact that face-to-face contact with patients – and building lasting relationships with them – are cornerstones of creating and maintaining a successful optical practice. Devices, platforms and digital tools are best used when they are combined with a personal approach that patients will never forget.